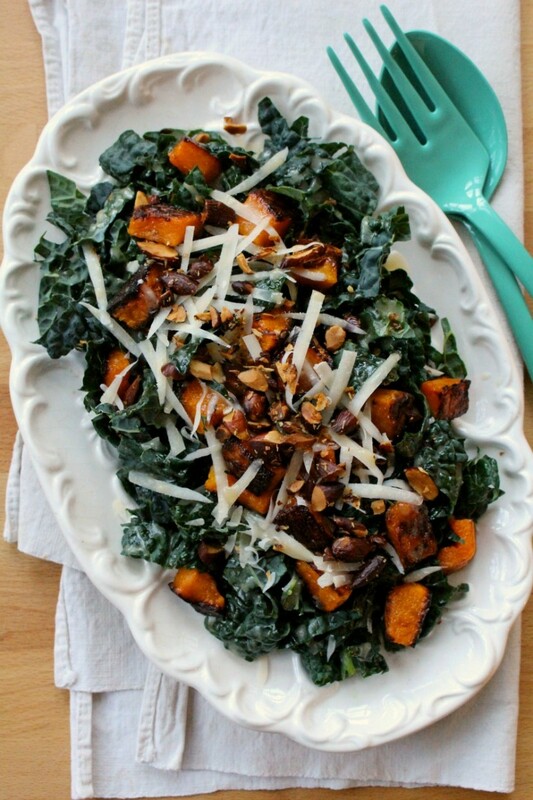 I know… it’s such a cliche to be serving up kale on the first Monday of January. But I had a bundle of dinosaur (or lacinato) kale in the fridge that needed using before I head out of town. I realize the last thing the internet needs is another kale salad, but I needed a kale salad. And I like kale. And I love roasted squash. And I love chopped, salted, toasted almonds scattered by the handful over things. And I had a jar of ginger-miso dressing on account of a magazine story I’m working on about miso. This is how dinner comes to be around here. I’ve never grown tired of that kale and Brussels sprout salad with garlicky, lemony dressing and loads of almonds and Parmesan, and I like a salad that gives my jaw a good workout. (That counts as an upper body workout, right?) And adding roasted butternut squash was a bit of brilliance via Food52 – I’m of the firm belief that almost all vegetables are best eaten roasted, and if you can keep yourself from gobbling them all up straight from the baking sheet, do very well in a salad. This combo hit all the right points, but feel free to mix and match whatever you have in your fridge or think might work – roasted carrots, or aged cheddar, or a creamy, garlicky tahini dressing – or you can always dress it up with olive oil and a squeeze of lemon. A note about the dressing: I like grating ginger on my microplane, which makes it very fine, and if it’s frozen to begin with, as light as snow. If you’re not one to keep a tub of miso in the fridge, swap some grainy mustard. If you do want to venture into miso territory though – it’s a paste made of fermented soybeans – start with white miso, which is milder. It lasts a long time in the fridge, and once there I’m sure you’ll find plenty of uses for it. 2Spread the cubes of butternut squash out on a rimmed baking sheet - lined with parchment, to make cleanup easier - and drizzle with oil. Toss them around to coat them in oil, sprinkle with salt and roast for 20-30 minutes, until soft and nicely golden. If you like, toss them on the salad warm - otherwise set them aside to cool while you cut the kale and shake the dressing. 3Pull the leaves off the ribs of kale and chop (or thinly slice, whichever you like) the leaves, discarding the stems. Put it in a wide, shallow bowl or on a platter (I always feel fancy putting salad on a platter) and top with the roasted squash. Shake up all the dressing ingredients in a jar, or whisk them together in a small bowl or measuring cup. Drizzle over the salad and sprinkle generously with chopped almonds and grated Parmesan. If there are leftovers, they're divine topped with a poached or fried egg. This looks and sounds amazing. On my to-eat list for January!! This looks DIVINE. 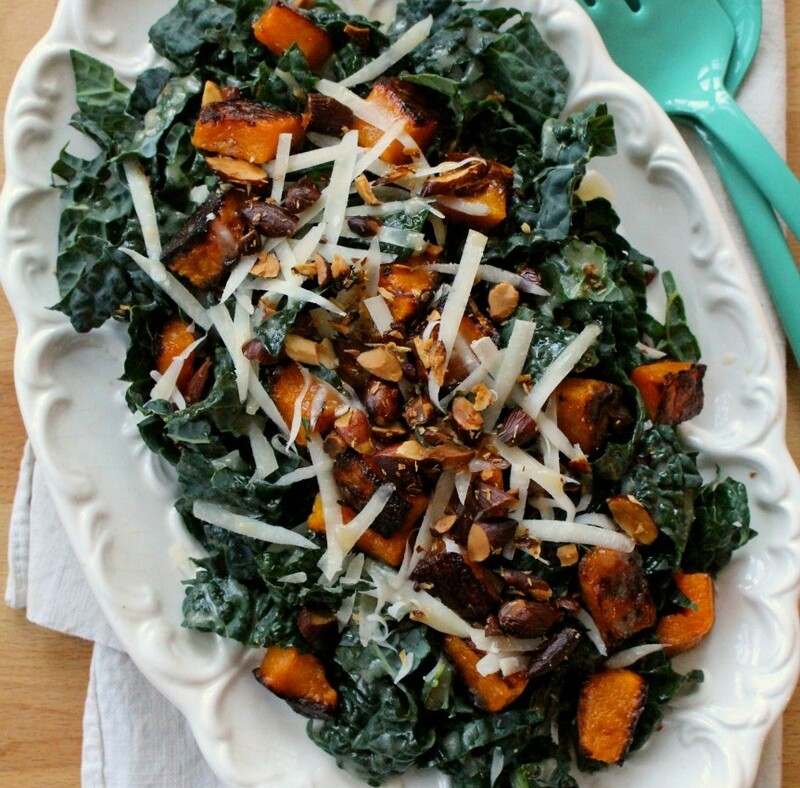 I am not sick of kale recipes! And I love miso so this is a great thing to find this morning. Thank you!